For decades, generic prescription drugs have been considered the bargains of the pharmaceutical world. An industry group says Americans have saved more than $1.5 trillion in the past 10 years on brand name drugs, thanks to generics. But in recent months, prices on some of the most popular drugs have soared, and experts are trying to figure out why. Buying generic prescription drugs feels like trading on the stock market for Cory Minnick. "Just seems to snowball every month, it gets worse and worse. You see stuff you used to buy for pennies for a hundred, and now you're paying $70 to $80 just to get it in," he says. Minnick, pharmacy manager at Royer’s on Sharp Avenue in Ephrata, Lancaster County, says he’s constantly checking with his three wholesalers to see what it’s going to cost to get a drug in the hands of a customer. The popular antibiotic doxycycline is used to treat common problems like urinary tract infections and pneumonia. It cost a mere $20 for a 500 pill supply in October 2013. Yet this past April, its price had hit more than $1,800. Don’t do the math on the percentage increase, it could get ugly. By the way, doxycycline has been on the market for 40 plus years, and the formula hasn’t changed. So what’s going on here? "These recent drug shortage and price hikes illustrate a third stage of the life cycle of a drug that we haven't really paid much attention to yet," says Jeremy Greene, a Johns Hopkins professor and author of Generics: the Unbranding of Modern Medicine. "What happens when a drug is no longer particularly attractive to generic manufacturers? Or when the interests of the generic marketplace continue to go towards the second pipeline, the pipeline of drugs that are going off patent now and the drugs that have been off for patents for a while are no longer particularly attractive and get neglected," he says. Greene says drugs used to have two cycles – the brand name stage, where the patent protects the work done by companies like Pfizer, and helps them recoup their investment in research. But then the patent expires, and all manufacturers have a shot to make and sell the drug, ideally, at a much lower cost. That what Ralph Neas, President of the Generic Pharmaceutical Association is focusing on. "It may go up 50% or a 100%, whatever it might but you’re still in the pennies and sometimes you get up to a couple dollars. A very few number are more than that," says Neas. 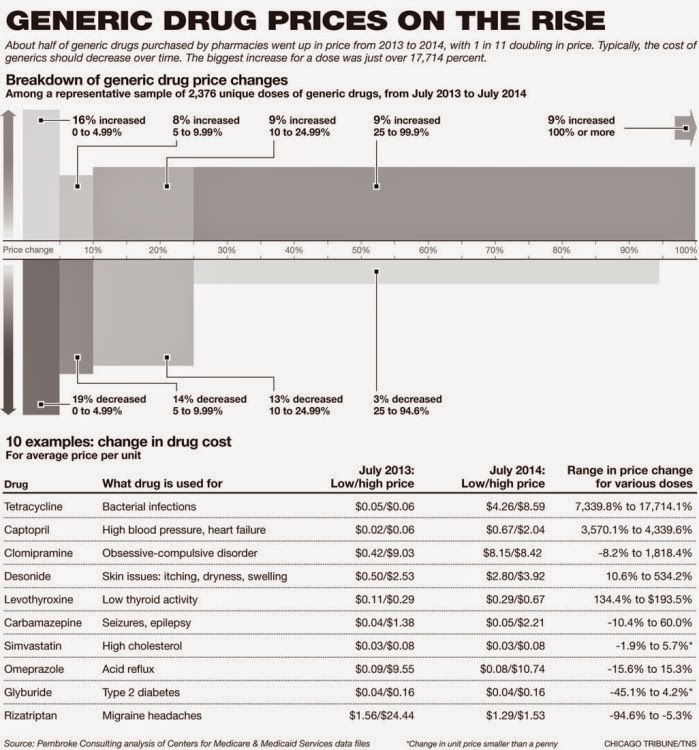 Here’s what we know: In 2010, the average cost of one of the 50 most prescribed generics was $13. In 2013, it hit $62. That data comes from Catamaran, which manages pharmacy benefits for 32 million people. A lot of theories are floating around, but the most prominent ones deal with raw material shortages and less competition. To continue reading click here.